It was a gloomy morning in Grand Cayman, and the tarmac was still wet from the rain that heavily poured the previous night. We grabbed a quick breakfast at a coffee shop in Camana Bay, awaiting impatiently 8 o’clock to arrive. At the dock, Captain Jon, owner of Slackem Charters, and his First Mate Peri welcomed us aboard the ‘Keeping It Reel’ and showed us our ride and roof for the next 4 hours. The 62′ Ocean Sport Fisherman vessel was equipped with a spacious air-conditioned cabin, including a galley (kitchen), 3 state rooms (bedrooms) and 3 heads (bathrooms). It was large enough to accommodate our group of 10, and the crew of 2. Since the weather seemed to clear out, I decided to climb upstairs and sit by the Captain. We slowly cruised towards the deep ocean. The usual calm and turquoise water was then choppy with shades of dark blues and greys, yet I could see some clear blue patches as we passed shallow areas. It wasn’t raining, but the clouds darkened the sky ahead making the picture beautiful and serene. 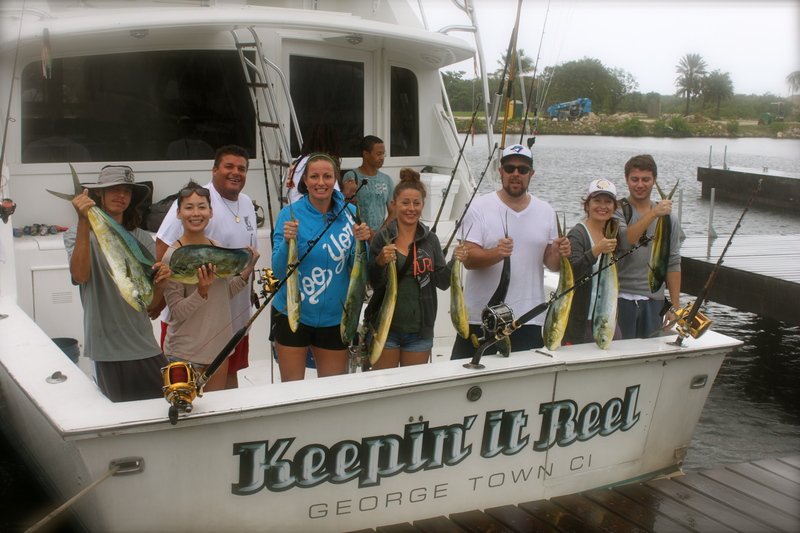 The 7 lines trolled behind the boat at different depths, and everyone was eager to catch a monster. At times the waves picked up, and if I only knew the trick of starring at an immobile point in the boat instead of watching the moving sea, perhaps I wouldn’t have lost my breakfast croissant in the toilet. While I tried to stabilize my motion sickness, laid on the couch in the cabin and starring at the ceiling, I heard the Captain scream: “Fish, fish!” I jumped off my safe zone and hurried to the deck. Kayla, whose sea sickness was beat by excitement to catch a prey, grabbed hold of the rod. 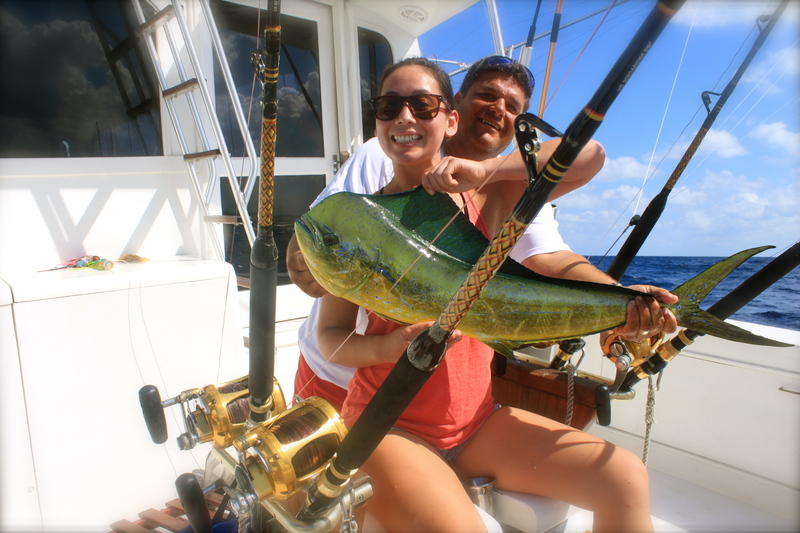 After sweat and strong efforts, she victoriously brought back the first mahi mahi onboard. Back to my couch and to my ceiling… until I hear the captain once more: “Fish, fish!” It was a big one. I was dizzy, could barely balance myself on the deck, but what the heck -I haven’t come here just to stare at a ceiling! I was in, rod in hand, and ready to fight the beast. This is the moment when you hate yourself for gaining those extra few pounds from wine and cheese and slacking on workout and exercise. Captain Jon strapped me to the chair. I wanted to strangle everyone for their endless encouragement words that didn’t help at all: “You’re almost there!” “Ya right”, I yelled between two breathes. “I can see the line 100ft away!” My whole body was shaking, already aching for days. I want to die. I want to quit. No, I won’t quit. I’m gonna get this fish into this boat and thank it for the good fight. Then I’ll eat it. After sweating the last drop of water I had in my already dehydrated body, I saw the end of the tunnel, or rather the tail of the catch. It took 20 min, and a load of sweats and swears, but I reeled it onboard, and all by myself! I didn’t feel sick anymore. I was too excited! Everyone got turns to reel the rods. 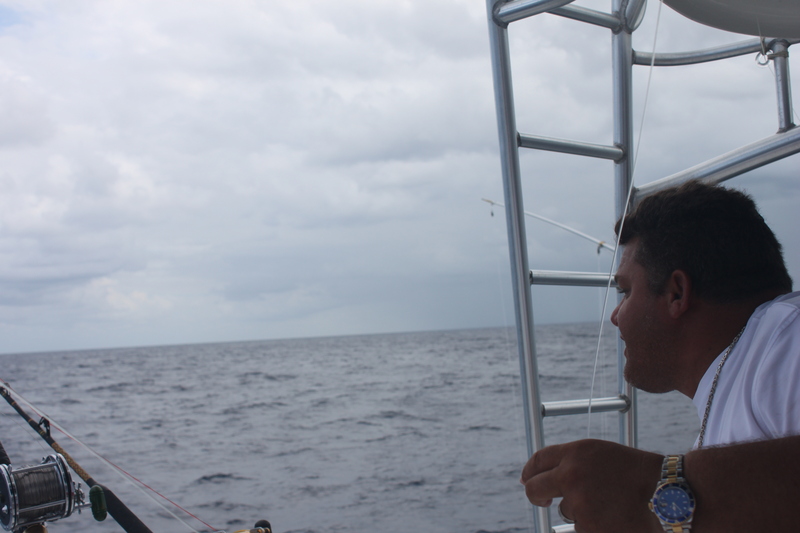 Captain Jon thought at one point we had a marlin. I’ve never seen someone so excited! I’m still not sure what he yelled at Peri, maybe some fisherman slangs in a Caymanian patois. On our way back, the sky growled and the thick black clouds released themselves. We sheltered ourselves comfortably inside the cabin and shared our experience. When we returned to the dock, Captain Jon offered to filet our fishes. I couldn’t resist and went ahead and ate a big piece. I was followed by everyone else. Amazing experience. Even in the gloominess, it’s beautiful. I have a Travel. Blog http://www.She-Travels.com, and I’m ways interested in options for women. Would you recommend, Sport Fishing as an option for a sporty woman, even just for a first time experience? Kindly let me know… Also, can I share this on my Travel Blog? Thank you Eden for your comment. I would absolutely recommend sportfishing for ANY women. I had my first experience in Mexico when I was 23 and reeled the biggest catch of the day: a 40 pound dorado. Each time, the Captains and the crews were very patient and helpful. I was definitely sore for days, but so worth the experience. Remember that the deep sea can be agitated and might not suitable for someone with severe motion sickness. And yes, I would be honored to have this post shared on your blog.